As Seen Through Windows, Bell Orchestre’s second release, was recorded with John McEntire at his Soma Electronic Music Studios. The result is at once fierce and beautiful, delicate and dirty. McEntire’s extensive studio knowledge and attention to craft provided Bell Orchestre with a kind of bridge, spanning the diversity of their sound to create a richly layered and sonically expansive recording; a recording that closely mirrors Bell Orchestre’s very process of making music. Opening with the distressed sound of muted and distorted horns, strings and drums—an almost monstrous sound, the album effortlessly shifts into an elaborate and soaring movement, sometimes edging close to fragility, sometimes on the verge of exploding, but never once faltering nor threatening to lose its way. As Seen Through Windows came out in 2009 and won a Juno award that year for Best Instrumental Album. Bell Orchestre is: Richard Reed Parry – upright bass/keyboard/percussion; Sarah Neufeld – violin; Stefan Schneider – drums/percussion; Pietro Amato – French horn/electronics; Kaveh Nabatian – trumpet/melodica; and, Michael Feuerstack – lap steel guitar. In 2006, their debut CD,Recording a Tape the Colour of the Light was nominated for a JUNO award in the category of Best Instrumental Album. Also in 2006, the band collaborated and performed with Edouard Lock, founder/choreographer of LA LA LA Human Steps, in celebration of the legendary dance company’s 25th anniversary. 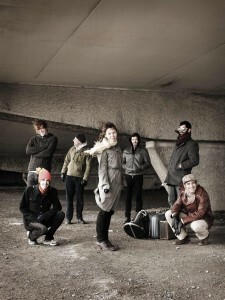 Bell Orchestre has toured extensively, playing as far a field as Lithuania and Dawson City, Yukon. As Seen Through Windows is distributed internationally by the Arts & Crafts record label.